Young teen John H. Dillinger stole a car in Mooresville, and a great criminal spree began. He was born on June 22, 1903 in Indianapolis, but by the age of 21 he was already convicted and jailed for nine years for holding up a grocery store. After his release he immediately began robbing banks throughout the midwest. Police caught and jailed him twice, but both times he escaped with help of accomplices, earning him early notoriety and attention from the FBI’s J. Edgar Hoover, who put the entire town of Mooresville under surveillance, lest he return to his parent’s farm. On January 25, 1934, John allegedly shot and killed East Chicago, Indiana police officer William O’Malley during another bank robbery. While awaiting trial he escaped from his cell in the Crown Point jail. and drove a stolen sheriff’s car into Illinois. By fleeing across state lines he committed a federal crime, and thus the ecstatic Hoover gained jurisdiction over his capture. Hoover and his “G-men” would begin a six-month pursuit of John and his gang, who would escape from trap after trap. Most notably, the FBI tracked him to the Little Bohemia Lodge in Mercer, Wisconsin. Tipped off seconds before, the group escaped, but not before the FBI men shot three innocent people, killing one. Embarrassed, Hoover declared John “Public Enemy #1” on his 31st birthday, June 22 1934. Through betrayal by his girlfriend, Anna Sage, the “woman in red”, they tracked him to the Biograph Theater on July 22, 1934, where agents ambushed and shot him dead outside as he left the movie “Manhattan Melodrama”. 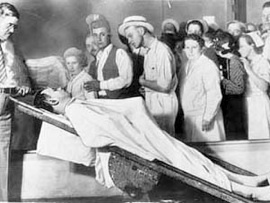 Public display of Dillinger’s body in Chicago. Unloading the body: Mooresville funeral home. 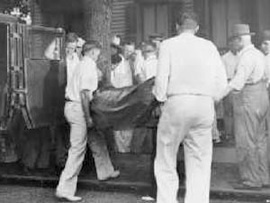 The Cook County coroner’s office displayed his body to thousands before being returned to the Harvey Funeral Home in Mooresville. He lies today in the ground in Crown Hill Cemetery, Section 44, Lot 94, less than 3 miles from where he was born. John Dillinger’s Grave in Crown Hill. 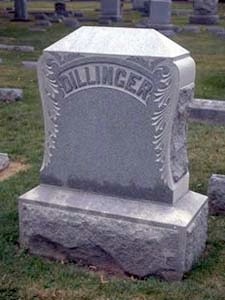 Many folks from Dillinger’s hometown of Mooresville believe that Dillinger was never killed. Even when John’s father saw the body for the first time he said ‘That’s not my boy.” The autopsy report, which was missing for over fifty years, has many glaring inconsistencies comparing the body with the known physical records of John Dillinger. The body is listed as having brown eyes. Dillinger had blue eyes. Known scars of Dillinger did not match up. Also the body was shorter than Dillinger. The clothes that the body was dressed in, going by Dillinger’s actual measurements, were ill fitting in the casket. The body also displayed a rheumatic heart condition. Dillinger never had rheumatic fever. It makes you wonder. Read Jay Robert Nash’s excellent book, The Dillinger Dossier, to decide for yourself.